I adore this room! I want to take every element out of it and transplant it into my boys' room ... it's perfection, in my opinion. So, here's how I decided to start ... with the artwork of course! 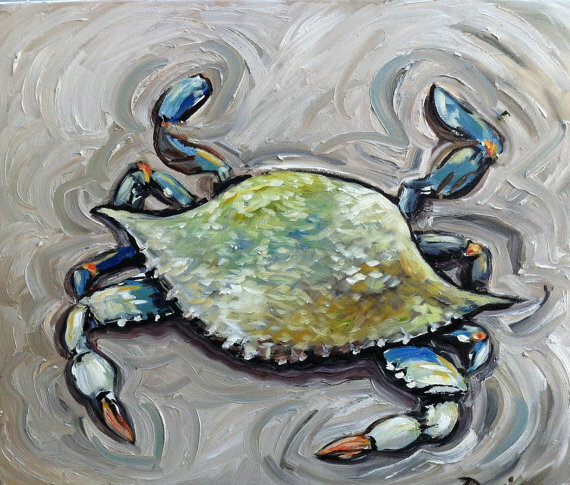 I love the crab painting by CatherineLovett, but it was a bit out of my price range. So, I found something similar that I really like on etsy and purchased that. The artwork from Recycled Wood Art is much easier on the budget and still similar in feel. Plus, it's an original painting and not a print, so I don't necessarily have to frame it (big budget saver!). Next, is the artwork and prints on the wall. I love how the art clusters together, so I started on the hunt for similar items in the light blue/teal hue to compliment the crab. I hail from West Virginia, and it's very important to me that what I select represents my home ... the easiest way is a map. Dixie Delights highlights maps of Georgia and Savannah on her wall, so again, I went to etsy and found this sweet map of West Virginia. The map from Blast From the Past is also an original and not a reproduction, which I really like (but this one will have to be framed). 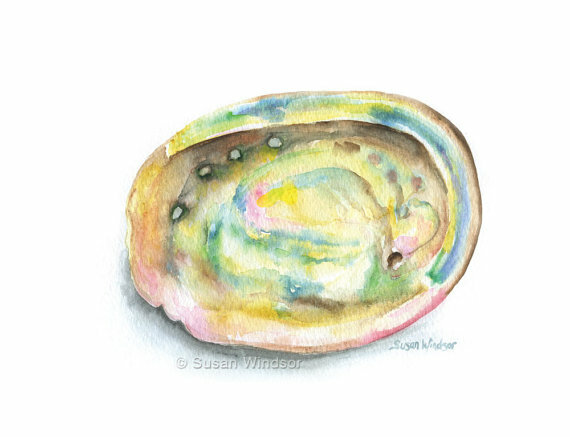 I also found this graphic print from Jessica Sutton - JSGD. It's perfect. My Jack loves to "rawr" like a dinosaur (he's 2), so I knew I had to have this from the moment I saw it. 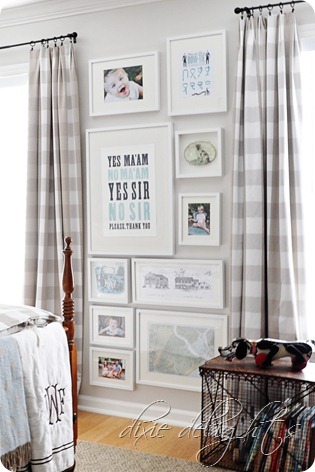 Plus it follows closely to my inspiration room photo without being a complete knock-off. The next item on my list to purchase is from The Old Try Print Shop. They're my new favorite, and I love that they're Southerners also...making it so much more appealing for me. I am going to purchase this print of lightning bugs (yes, lightning bugs and NOT fireflies to all of you non-southerners out there). I love it and it reminds me of my childhood. 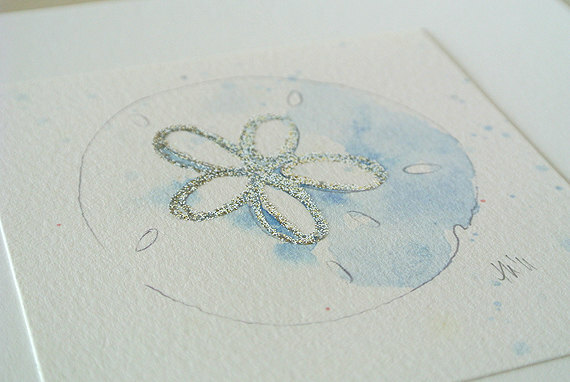 I've also been scouring etsy for small, original watercolors to frame, but have yet to purchase anything. Here are a few shops that I've found items that I like for now. I keep adding them to my favorites on my etsy account, so that I can easily find them when needed. 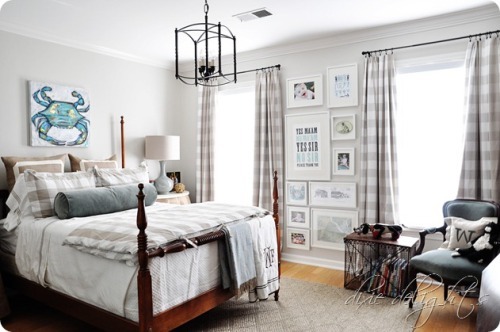 Visit Katie Berger's wedding planning website, and for more information on a great home study Interior Design course, please visit the website of the Sheffield School.